With beautiful weather forecasted, large crowds are expected at the 88th annual National Cherry Festival, which kicks off unofficially tomorrow and runs through Saturday, July 12. 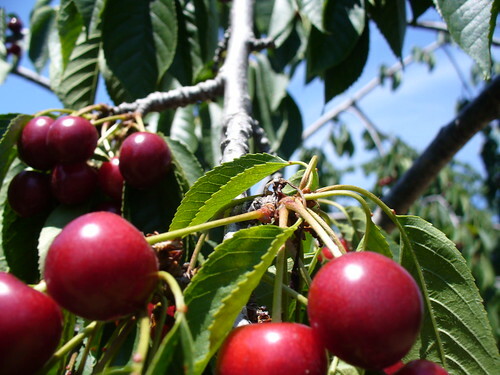 The celebration of cherries and community in the heart of Traverse City, also known as Cherry Capital of the World, offers something for everyone to enjoy. Whether you’re into live music, carnival rides, art, or cherry-themed food specialties, you’ll find it here. Plenty of healthy events are scheduled, including a downtown farmers market, teen disc golf, beach volleyball, Zumba by the bay, and races for kids and adults. Make sure to stop by Blue Care Network’s Health by the Bay expo on Monday, July 7, from 10 a.m. to 3 p.m. for free health screenings and body mass index measurements. You’ll also be able to talk to health experts and learn about local resources to help you get fit and healthy. No matter why you go, know that you’ll be in for a fun, family-friendly time. Brent Bradley, Vice President of Sales and Marketing for dried fruit manufacturer Graceland Fruit in Frankfort said the festival is the perfect summertime activity for families. “Some of my best memories are going to the festival and going on the rides and all the family events,” Bradley said. Graceland Fruit is leveraging the exposure the festival provides to unveil their new line of dried fruit snacks, which includes blueberries, cranberries, and of course, cherries. The official mascot for the 2014 festival is Graceland’s own “Super Cherry”. He’ll be handing out free samples of Graceland’s products or you can check out their booth in the vendor area, located near the festival entrance at the open space along the shoreline of Grand Traverse Bay. Not a cherry fan? You might want to reconsider that position for your health, says Mitch Seymour, a research investigator at the University of Michigan. He said tart cherries in particular are being looked at for their potential health benefits. Studies with tart cherries have focused on heart disease, arthritis, sleep, muscle recovery, and bone metabolism in postmenopausal women. Seymour said he’s worked mostly with Montmorency cherries, a common variety grown in Michigan. His research has investigated the links between tart cherry consumption and a reduction in inflammatory compounds that contribute to heart disease and Type 2 diabetes. He said whether they’re dried, frozen, or in juice form, tart cherries can definitely give your health a boost. “We would ideally like people to incorporate them into their diets,” Seymour said. We know just the place to start!